Tim Javorsky is all about the numbers. 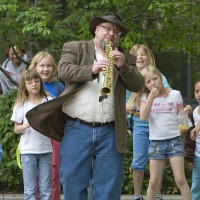 His wife Dorothy calls him a triple threat: Saxophonist, singer, and bandleader. And not just alto or tenor, mind you, but soprano and baritone sax too. And not just a singer of a certain style, but a vocal chameleon that can channel Louis “Satchmo” Armstrong, Elvis, Frank Sinatra, or whatever styling suits the music. Tim started studying saxophone at age 9, then went on to study classical sax and voice at the University of Nebraska at age 14, taking on professional gigs at 18. He went through a various assortment of desk jobs after college, but the calling perform was too strong to ignore. He decided to become a full-time entertainer in 2010, averaging 65 performances per month, one year peaking at 893 for the year! He has performed from the Great Lakes to the Rockies, from Minneapolis to Kansas City to cheering audiences. In order for the flyer to print correctly, be sure to read through our print instructions.